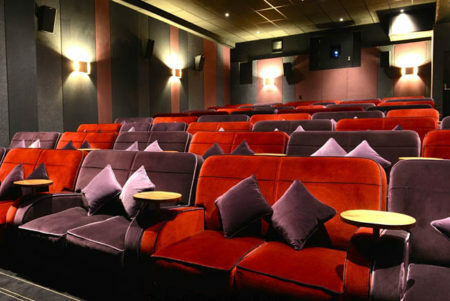 Let’s go to my local, the Everyman Cinema. It’s small and cosy and has just three screens, not 75. It has a snazzy bar. The staff are terrific. A waitress brings you food and wine in the cinema. You have little sofas and cushions. And it costs a fricken’ arm and a leg, transforming a night at the cinema into a night at the theatre, price-wise. It also, unfortunately, has a dazzling Exit sign in the auditorium that blots out all the dark tones on the right-hand side of the screen, as if all the attention had gone into the front of house, not the cinema experience. Last night (at a screening of ‘Us’) the people next to me had cocktails, a bottle of champagne, pizzas, nachos, something else in a basket, then gins and tonics. They chattered excitedly through the film as if they were at home, and reminded me why I don’t much care for the cinema ‘experience’. We were early, so there were commercials. I haven’t seen a commercial all the way through in about ten years. My God, they’re cheesy. There were also ads for ‘Exclusive VIP screenings’, which presumably cost more, but I struggle to see what makes them exclusive if anyone can go just by forking out. Surely this negates the use of the adjective? Am I overthinking this? The fancy boutique cinema chains are a far cry from seeing films in LA surrounded by Mexican families with crying babies (at horror films!) or glue-snorting tramps in the sort-of-missed 42nd Street fleapits of NYC. Equally they’re a long way from the Vue cinemas, or as I like to think of them the Wetherspoons of film, in that they stink of stale food and make you wish you’d stayed home. But home was once the place where you played your DVDs, and now the home entertainment hardware is being phased out by an industry desperate to charge us repeatedly for the same thing. Because discs mean that for the particular film you purchased a customer has been lost forever, or at least until the next higher-definition disc comes along. But streaming bleeds you constantly. If you have no scruples you can download a movie and link it from your laptop to your TV screen with ease. If you’re a geek, OCD-ish collector-type you can purchase 4K discs. But if you want world cinema, documentaries, old B&W films, you’re still reduced to hunting around online bargain bins. The studio argument is, who cares about seeing Bunuel’s (or insert author of choice here) early films? Well I bloody do. I’d like them to be given the same treatment that crappy studio releases get, decent prints, hi-res images, good sound, subtitles. They’ll do it for a crummy ‘Halloween’ reboot, so why not for say, ‘Tristana’? Well, because the economics don’t stack up. But given the choice, I suspect most of us would rather own the film than spend twice the amount seeing it at a cinema ‘experience’. That theatre looks and sounds like a setting for a “make-out” date. They could show anything, it wouldn’t matter and that exit light proves it. The light has to be clear so that if a fire starts the half drunk “audience” can find their way out. It’s well over ten years since I have been to the pictures. This was around the time that the audiences started to treat the auditoria as their own living rooms and the mobile phones were already becoming an addiction. Why bother, when I can get the DVD and watch at home on a big screen and good sound? Anyway, I dislike American/Hollywood films that weren’t made more than 40 years ago and have always preferred British films which don’t get a fair showing at the multiplexes. The original Everyman, in Hampstead, was my education in cinema, even more than the Scala. Young and impoverished, I could see a different triple bill every day. When I became disabled I could go every day too! Since it became the flagship of a chain about twenty years ago, I’ve been twice. Really excited to read you been to see ‘Us’ Chris. I thought your thoughts on this might have been included in a paragraph towards the end …or will a little personal review of this film follow in a further post? I’ve seen the preview and it looks intriguing and sinister and definitely on my watch list – as is ‘Ma’ starring the wonderful Octavia Spencer as a woman who you definitely wouldn’t want at any of your parties. Some quite interesting ideas for new and upcoming horror films lately instead of the usual ideas of tourists stumbling into deranged countryfolk or demonic children! Your wish is my command, Jay. Coming right up. Everyman took over our local single screen cinema a couple of years ago and converted it into three screens which, while giving us more choice, practically doubled the ticket price! On another subject, I was waiting for my late-running brother outside Forbidden Planet on Wednesday morning and you walked by, Chris. I was about to tell you how much I was looking forward to listening to the audio version of The Lonely Hour and my brother called me with an update just at the wrong time! I have since started the book and, although I’m not very far into it, it has made me laugh out loud – in public – at least three times. Always a good sign. Admin, have you had a look through Network’s catalogue of films and old TV to buy on disc? Recently listened to a great podcast interview with the boss. He talked about the process of locating and cleaning old film to make Blu-rays. Not sure if their stuff is what you want for your home cinema experience, but they seem to share your views on preservation, variety and not streaming! I used to love going to the cinema. Not any more. The people who go nowadays seem to have no idea of the point of a cinema. They talk all the way through. They have loud conversations on their phones. A great many cannot seem to be able to follow the plot of any sort of movie, and will constantly set up a non-whispered dialogue of: “What’s happening now?” “Who’s that?” “Why did they say that?” etc., I refuse to pay to sit with morons, and would rather wait for the film to come out on DVD/Blu-Ray. Additionally, there’s this idea that a film cannot be enjoyed unless your seat moves, vibrates, etc., with the action. I found it to be TREMENDOUSLY offputting, and was glad it could be turned off. Many years ago, in the late 1970’s, I went with a mate to see a movie. In front of us were two people of a similar age (16/17), who would not stop talking. Several other people shushed them, but were told to “Go forth and multiply”. My friend then says to me: “We’re going”. I’m surprised, because it’s only about halfway through the movie. The idiots in front are still nattering away. Then my friend says to them: “Goodnight”, and promptly bangs their heads together. We then left. Sharpish. Where that Cinema was is now an empty British Home Stores branch. I’ll not post a link, partly because it will not surface till Monday, but mostly because it will spoil the fun of finding it for yourselves! Reproduced for those with an obsessive thirst for detail and a grasp of luminous flux per unit area only. Snowy: Should the original wiring not take this into account? (Of course, but how many wiring people would be able to realise it would “affect normal working”) Of course I was told years ago that it was my responsibility to ascertain the emergency exits before the lights went down. Sometimes I even remember to do that. What ever happened to personal responsibility? If a company is charging a considerable premium on the basis that they will provide a better quality cinema experience, then the inability to project a film properly is an extremely basic failure. And grounds for a reasonable complaint. Snowy… thanks for pointing out the “Rules of Conduct”, which i am surprised , too, haven’t been mentioned. I will also leave it as an exercise for the readers to acquaint themselves with these tenets of cinema-going politeness. BTW, I assume that you are also in hock to those gentlemen via iWittr…which now has a Birdsong Button! I thought not having a ‘generic fruit-based device’* would exempt me from having to pay a tithe to the ‘Church’! But apparently not satisfied with the vast pools of cash that ‘iWittr’ provides to fund their lavish lifestyles, they have fashioned ‘Wittr’ to wring money from dissenters who favour cybernetic communicators. I’m sticking with my Aldis lamp, [called Brian] and stapling notes to pigeons. Hello to you know who! … And down with the Nazis!